Northridge Mall: $2,500,600. Photo by Jeramey Jannene. Neglected buildings, and mismanaged fortunes face similar downward trajectories — a slow decline followed by a catastrophic collapse. 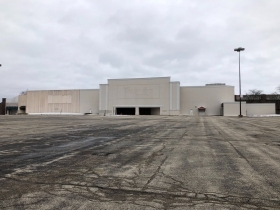 Northridge Mall, on the northwest corner of the City of Milwaukee is a case in point. 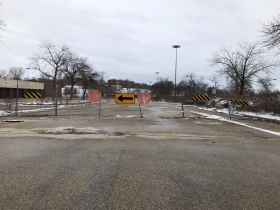 The 100-acre shopping center was developed in 1972 by members of the Kohl family, who managed it closely from their Milwaukee base of retail stores. 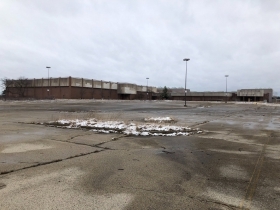 Following a development model common among similar projects (including its sister mall Southridge), it had four large department store anchors: J. C. Penney, Sears, Gimbel’s and Boston Store. The property was sold to outside investors in 1988, and within 15 years it was shuttered. 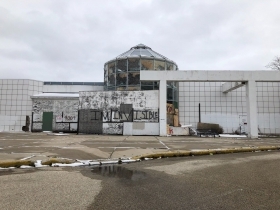 Since 2003 the 1,120,440 square feet of building and support space has remained vacant, prey to vandals and other miscreants. A Chinese investment group identified as US Black Spruce Enterprise Group, Inc. bought the mall in 2008 for $6 million. Since then it has made no improvements, nor marketed it to tenants or accepted offers made to purchase the property. Nor has it communicated with city officials. It is delinquent in its property taxes, as well. As my colleague Jeramey Jannene noted in a story, the order sets in motion a process of demolition of the building, and for possible seizure by the city. The order was announced at a press conference held at the site by Mayor Tom Barrett and Ald. Chantia Lewis, who represents the district. The building would require some $6 million in repairs to be made habitable according to city calculations. Yet the improvements have a total assessed valuation of merely $81,700, or about $0.07 per square foot. By that standard a 2,000 square foot house would be valued at $140. But this is a million square foot property — about the same size as the U.S. Bank Building, Wisconsin’s tallest. The vacant property, in addition to providing a health and safety hazard, has a depressing effect on the neighborhood — and on city tax collections. 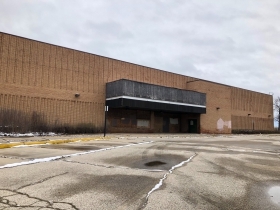 Northridge was located in what had been the Town of Granville, which was the site of a contentious battle in the mid-1950s between the City of Milwaukee and residents who resisted annexation to the city. The city won most of the property, while the remainder became the 4.39 square mile Village of Brown Deer. The annexation pushed Milwaukee’s city limits up to the border of the 42-square mile Town of Mequon, in Ozaukee County, which incorporated as a city in 1957, halting Milwaukee’s northward expansion. The development included nearby housing, including Northridge Lakes, a rare high-rise residential building, and the nearby Alexian Village retirement facility. But these structures, while in sight of Northridge, were a good quarter mile away. Today, we embrace the ethic of “Live-Work-Play” in a single neighborhood; Northridge separated these uses, and now 100 acres lie fallow beneath a surface of asphalt topped by a crumbling structure that was once the crown jewel of mercantile activity, seventies suburban style. The investment firm owns three separate parcels, two of which face In Rem proceedings by the city in addition to the condemnation order. Taxes for 2017 are delinquent in the sum of $105,767.27 for the 973,087-square foot parcel at 9009 N. Granville Station Rd., which includes the giant building. The land is valued at $1,161,600, while in 2009 it was assessed at $2,904,100, evidence of the blighting effect of a vacant building on the property it occupies. In 2009 the building, already vacant for six years, was valued at $596,000, while today it is assessed at a mere $81,700. Taxes are delinquent for 2017 in the sum of $64,557.10 for the 604,700-square foot parcel at 9101 N. Granville Station Rd. Curiously, 2018 taxes for both properties are current on the installment plan, as are $46,100 taxes for the third parcel, a 448,537-square foot property. In all, the Black Cedar group owns 2,026,324 square feet of land, or over 46 acres, valued at $2,418,900 for the land, or $1.19 per square foot. The city clearly feels this is not the highest and best use of the property, and thus has undertaken its condemnation. The catch, according to Jannene’s story, is that demolition costs could total $12 million, which is double the sum the city has budgeted for all city demolitions this year. 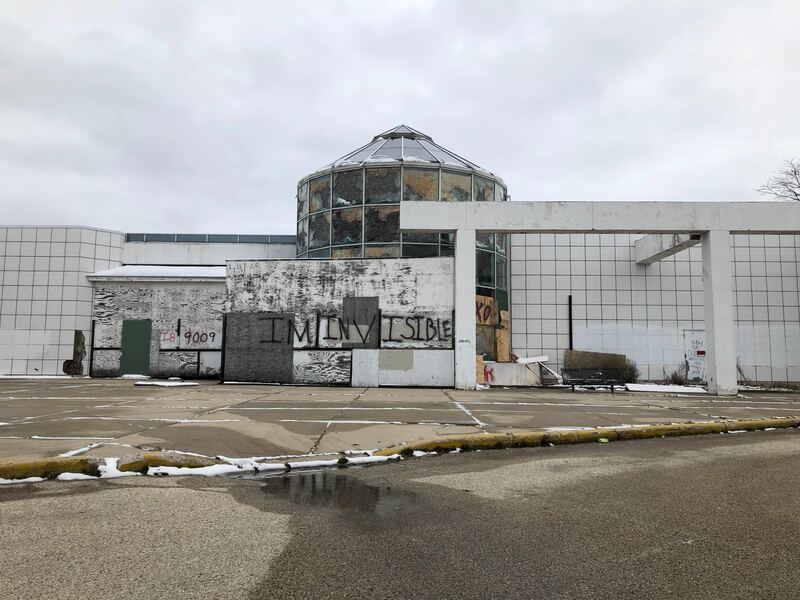 The city could use its powers to encumber the property with that expense, and eventually recoup its investment when the site is redeveloped, possibly with Tax Incremental Financing funds. 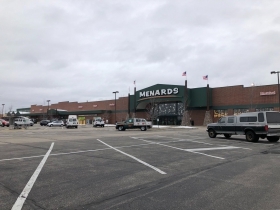 A 689,555-square foot parcel of the property was redeveloped in 2004 as the site of a 173,090 square foot store for Menard, Inc., the Eau Claire-based home improvement retailer. Today the land is assessed at $2,057,900, or $2.97 per square foot. The building is assessed at $4,431,100 for a total assessed valuation of $6,489,000. Taxes of $180,534.52 are current on the installment plan. Owner: US Black Spruce Enterprise Group, Inc., Germantown, MD. Registered Agent could not be identified. Firm, a Chinese investment group, purchased properties for a total of $6,000,000 on 07/24/2008. Categories: Real Estate, What's It Worth?